In which Zorro gets his “faithful” horse. Alejandro Murrieta, the young urchin from the prologue, all grown up. A semi-reformed bandit under the tutelage of escapee Diego de la Vega. He will, spoiler, soon assume the mantle of Zorro, but based on his woefully incomplete outfit and un-professionalism here, it’s safe to say he hasn’t graduated yet. Played by Antonio Banderas, who isn’t in enough movies lately if you ask me. Armed with: goes into battle with a rapier here, but loses it and improvises with what he can find, including a sword and knife from his opponents, a mounted bull’s head, a pair of cannon balls, and an actual cannon. A barracks full of soldiers, over a dozen or so of them. Working for Don Rafael Montero and under the direct command of professional soldier Captain Love. More cannon fodder, presumably played by stunt men and local actors. The skeezy-looking leader is played by (near as I can figure) Pedro Altamirano, and the only other notable one is a rather enormous fellow, played by Óscar Zerafín González. Armed with: They may have some guns about but none of them really come into play, mostly swords and fists. The Setup: After twenty years, Don Rafael has returned to California with some sinister scheme afoot. Upon learning of this, Diego escapes his hellish prison (he didn’t think to do that earlier?) to thwart his old rival. But after being stymied in his post-escape efforts to kill Montero, de la Vega instead takes up the cause of rehabilitating Alejandro, himself despondent and suicidal after the death of his brother (courtesy of Captain Love). Diego blows the dust off his old Zorro lair and gives him a crash course in badassery, honing his swordsmanship, strength and agility in order to help him take revenge on Love… and, Alejandro gradually deduces, to groom him as a successor. I’ll note here that few things in movies are cooler than post-jailbreak Diego during this middle part of the movie. Good old Anthony Hopkins plays the man as a long-haired, cigar-smoking, wine-guzzling, open-shirted bohemian who uses his whip to flick out candle flames for fun. And also just because he CAN, presumably. He’s a retired superhero but he’s also the weirdly cool uncle you never had. It’s a riot. Anyway, after a few training montages, Alejandro spies Montero’s soldiers with a freshly-purchased and unbroken black Andalusian horse, similar to Zorro’s old steed Tornado. Seeing a chance to irk Love’s men and still a thief at heart, Alejandro dons a subpar Zorro mask and sneaks off an unsanctioned mission to steal the stallion from the soldiers. Along the way he has his first meet-cute with the also-grown up Elena, whose natural passion and righteousness weren’t repressed even after two decades of being raised by Rafael. He sneaks into the stable adjoining the barracks (it can’t be great trying to sleep next to that smell every night, come to think of it) and locates his target easily enough, but there are… complications. The Fight: Alejandro gets on the horse, but as soon as he tries to ride it out, it objects, and the wild bucking eventually sends the pair crashing into the soldiers’ sleeping area. The new Tornado inadvertently handles just a bit of Murrieta’s work for him by kicking a few panicked soldiers out of the way, but when the horse smashes through the wall like the Kool Aid Man, his new “owner” falls off, and is left utterly surrounded by a lot of very pissed off Mexican soldiers. What follows is a good bit of fun. The fight signals its intentions early, as that traditional Looney Tunes bit goes down where everybody dogpiles on the hero at once, only for him to calmly climb out from underneath the teeming mass. Ridiculous, but it establishes that this is meant to be an amusing scene rather than an exciting one, and for better or for worse it certainly plays out differently than the rest of the film’s action. And it’s inventive. After pulling off the tried & true method of swinging on the chandelier and using roped counterweights to ascend higher, the hero seizes a mounted bull’s head and uses the horns as a weapon, then ducks inside an open jail cell and when his pursuers on the other side try to stab him through the bars, he uses the sliding door to trap & mangle their swords. Throughout the whole thing Murrieta never stops moving, constantly punching, kicking and dodging. Soon enough he grabs a couple blades of his own (sword & knife) and does even better, but he backs into a giant soldier who shakes him free of his weapons. The guy looks enormous– seemingly over seven feet tall, but possibly more in the 6′ range since he’s mostly contrasted against the relatively diminutive Banderas. The remaining soldiers step back to gleefully watch this monstrous Mexican man-mountain take out Alejandro on his own. Backed into a corner, Murrieta grabs the nearest weapons at hand– two cannon balls– and when the giant gets close enough Alejandro bashes them simultaneously against both sides of his foe’s face. The giant is not visibly stunned at first, but after repeated blows, he eventually turns around in a daze and, rather comically, spits out a whole mouthful of teeth at once. Ouch. While the remaining soldiers were watching dumbfounded, Alejandro loaded and primed the nearby cannon, so that when they looked back up at him the fuse was ready to light. Now they’re LITERALLY cannon fodder. 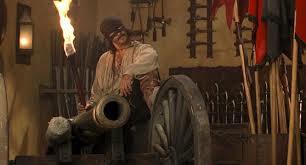 The guards scamper away and Alejandro blows a new hole in the wall, spastically proclaiming that he is Zorro and that “the legend has returned!” Of course, since we can’t leave the scene without one last joke, the hero accidentally blows up the whole building (due to all the exposed gunpowder) and barely escapes alive. As mentioned, not much to it and more silly than thrilling, but still a lot of fun, and most importantly, a nice bit of action filler to pass the time until the next real fight sequence (which won’t be for a while). Banderas is quite capable, acting cocky but not as cool & competent as he will be later on. The actors playing the faceless goons sell everything well and the music is appropriately mischievous. Recommended Links: If the Puss-in-Boots films don’t work out, Antonio can always go back to his– how do you say? Ah yes– talk show. Coming Attractions: Are you ready for the fun part? Time to play dress-up. No, not like that…. This entry was posted in Mask of Zorro, The and tagged Mask Of Zorro, melee, swords.